Laguna Pools is a custom pool building company located in Katy, Texas and has been serving the Greater Houston area for over 38 years. Known for exceptional customer service and quality craftsmanship, the company offers a wide array of services ranging from custom pool construction to landscape services and weekly pool maintenance. At Small Screen Producer, we created a website and branded social media presence that reflects Laguna Pools’ commitment to excellence and showcases their exceptional offerings. We created an engaging and updated website, as well as branded social media accounts, an integrated blog and a vast library of video featuring Laguna Pools’ design options in an engaging, more realistic way. 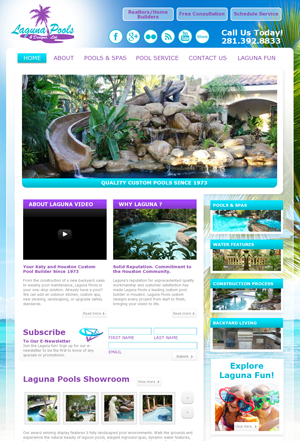 Laguna Pools’ new website features shareable photo galleries and a video idea gallery with product and design-specific content to create a unique pool buying experience for customers. This feature engages customers by providing visual content that presents Laguna Pools’ offerings and provides information and images on the various options available to customers. The Laguna Pools Showroom photo gallery includes images from the company’s retail display of 9 fully landscaped environments, offering a quick and easy way for customers to engage in the pool buying process. Plus customers can choose to share the pictures and videos with family and friends via social networking sites like Facebook, Twitter, and Google+ with one click! The website also prominently features quick click buttons for free consultations and service scheduling with the trained, professional staff and technicians at Laguna Pools. To learn more about how Small Screen Producer can help you create engaging content and establish a great web presence, contact us today!